This piece was inspired by the time of evening when the sun has just kissed the horizon and appears to be a slightly squashed, fiery ball. Clouds above it are splashed with gold. The kettle itself is of maple. 23k gold leaf and several different types of paint and varnish have been used in the finish. 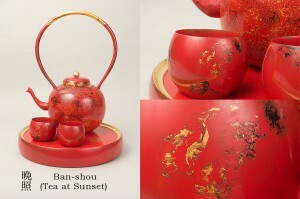 The chawan (teacups) are of maple and finished in the same manner as the kettle. The tray is of sapele. The mon, or signature in red on gold leaf, says Shiranami, White Wave, the name of the sailboat my dad had built in Japan when I was a boy and on which many wonderful cruises were made in the Inland Sea.